Corrie works with Aaron as a community aide, which really means that she hangs out with Aaron on Sundays. They go swimming, build Minecraft snow blocks in the yard, and have a lot of dance parties. They chase zombies in the Corn Maze, jump on trampolines and go to Bugs Bunny symphony concerts. Aaron adores Corrie. He wakes up every Sunday morning, and demands: WHERE’S MY CORRIE? Corrie presented eloquently to the class about what she’s learned working with children with differences over this past year. She reminded me today that we are blessed to have a community of support for Aaron and our family. This does not automatically happen. This is something that families have to build themselves, through great effort, and with some heartbreak when things don’t work out. We have had many people come and go in our lives since Aaron was born. I remember some of them by name, like Jess, who was his lovely aide in preschool, and who just had her second baby, and Mrs. Brock, who was his wonderful educational assistant in grade 2. 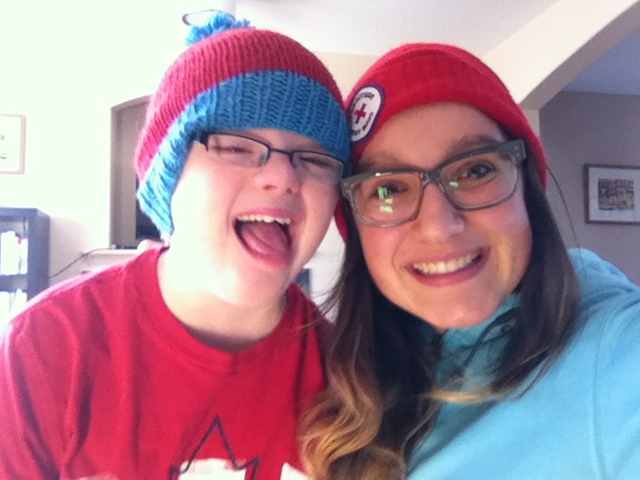 There has been Bronwen, his amazing OT who showed us Aaron’s awesome again when he was struggling in his old school, and Katryna, a neighbourhood girl who babysat him through her teenage-hood and now is studying to be a Speech Language Pathologist. There are people from the early days whose names I can’t remember, like the Home Care staff, who were Aaron’s biggest cheerleaders when he was just born. Aaron’s Corrie is young, energetic, and loves to be active. She’s skilled at seeing the world from Aaron’s point of view, and has an open mind to people with differences. She’s a smart and creative problem-solver, and has bucket-loads of patience. My husband and I often work when she’s with Aaron, but sometimes we sneak off for a date – that is time well spent too. Parenting any child is hard work. Having a child with a disability means that we need to amass a bigger village of love for our kids. I listened to Corrie today talk about how Aaron and Karen’s son have taught her to slow down, and to live in the moment. It meant the world to me to hear her share her lessons she gleaned from working with our boys. Cheers to Corrie and all the other Corries in our lives, who are open hearted and giving. Cheers to those who believe in our kids. We need more Corries, Jesses, Mrs. Brocks, Bronwens and Katrynas in this world.